When Molotov Alva decided to make a documentary, he picked up a camera and started shooting the world around him. There’s just one little twist: Alva is an “avatar” in Second Life, the virtual world created by Linden Labs. When one lives in a “fake” world, is it possible to engage in an art form that centers on capturing reality? Director Douglas Gayeton believes it is. 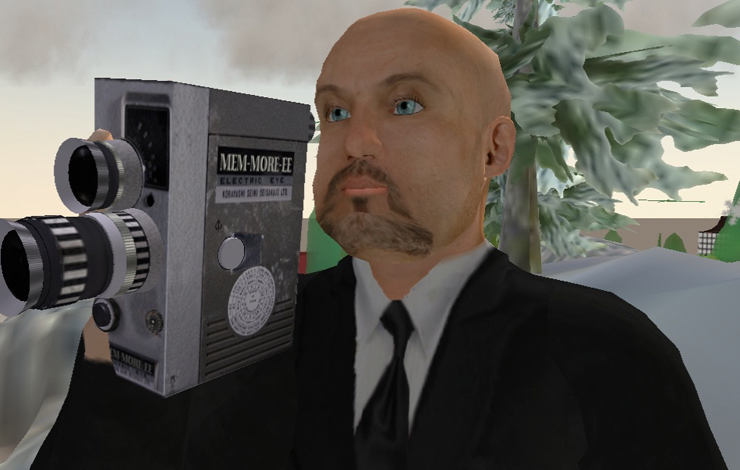 He was approached in 2006 by the Dutch company Submarine about making a documentary for the Web, and thought Second Life (SL) would be the perfect subject. Though not many had heard of the virtual world at the time, Gayeton has a history with the subject matter. He and science fiction author William Gibson co-wrote and directed Johnny Mnemonic, the first interactive film on CD-Rom. He has also had a hand in creating a number of different social networks and online communities both in America and Europe, having built applications for AOL, Microsoft, Vivendi and Napster. What it became was several months of Gayeton immersing himself in SL, learning the culture’s conventions and mores. He created his avatar, Molotov Alva, who had to overcome the challenges of entering a closed community and gaining the inhabitants’ trust. Gayeton compares the process to that of an anthropological documentarian who goes down to South America and goes through various rites of passage in order to become part of a tribe he or she is hoping to film. Finding and working with the subjects of Molotov Alva presented an issue unique to SL. According to Gayeton, there is a generally accepted code in the virtual world that people don’t ask about who you are or what you do in “real” life. You never know anyone’s real name. When Gayeton and Alva wanted to contact an SL resident to set up an interviews or rendez-vous, the practice was to e-mail them at a Gmail account set up in their avatar’s name. Alva and Gayeton ultimately made a film where they never met any of their subjects in the flesh. The next challenge was figuring out the answer to the question, “How does one film in a virtual world?” Gayeton experimented with a half-dozen screen capture techniques, but found that none of them quite met his standards. Finally, he sought advice from a friend at an animation studio, who turned him on to Disney’s early method of simply filming the screen. Gayeton was surprisingly impressed with the results, and this ended up being the way he captured most of his footage. Gayeton’s filming process is crucial to understanding the documentary nature of the project. Molotov Alva looks like an animated film, and it’s easy to assume while watching it that the director just created the scenes he needed. But Gayeton is not an animator, and Molotov Alva is not a special effects film. The only reason that his film is animated is that the world he is documenting happens to be an animated world. The visual style of the film simply reflects the reality of Gayeton’s subject. Molotov Alva ultimately takes the form of a series of dispatches from SL exploring issues ranging from relationships to individual freedom to personal identity. Early on, Alva meets “hobo king” Orhalla Zander, a seeker who scoffs at the pursuit of personal possessions, and who inspires Molotov to seek the Creator of SL. Subsequent dispatches involve Alva’s romance with Abigail, as well as his adventures among the various SL communities such as the Furries. Gayeton’s project landed at HBO after a Submarine staffer inadvertently uploaded the first episode to YouTube. Several prominent bloggers discovered the dispatch and wrote about it, and shortly thereafter, it became number one on the popular video-sharing site. This garnered the attention of HBO, which acquired it for Cinemax Reel Life. It's the first SL machinima to sell to a major TV broadcaster. Committed to staying true to the new media nature of the project, Cinemax plans a cross-platform release strategy. Dispatches one and two will air online beginning on May 1, 2008. Dispatches one through eight will be available on Cinemax On Demand beginning May 8, leading up to the May 15 Cinemax broadcast debut, which will be simulcast on Cinemax.com and in Second Life.